The final report of the 1996 World Food Summit states that food security “exists when all people, at all times, have physical and economic access to sufficient, safe and nutritious food to meet their dietary needs and food preferences for an active and healthy life.” The U.S. Department of Agriculture agrees – at least in theory. In 1998, I was hired to interview women on welfare to find out how they were making ends meet after Bill Clinton signed the 1996 “Welfare Reform Act.” The act essentially gutted safety nets and imposed sanctions on women who did not comply with the welfare to work mandate. The mandate ultimately befitted corporations, not poor people. This is the story of one of those women. Pat* was on welfare when the law changed. On the week that she was supposed to start the mandated classes at the Department of Human Services, she called her caseworker to see if she could reschedule the start date. She wanted to be with her mother who was dying in the hospital. The DHS worker denied her request and told her that if she did not show up, she would lose half of her welfare benefits per the new law, including food stamps. Pat chose to be with her mother instead and lost half of her food stamps and cash benefits as a result, even though they weren’t much to begin with. Her mother died. Pat fell into a terrible depression. Then, Pat’s teenage daughter started acting out. (When children experience loss, grief, hunger, poverty and/or discrimination, many do “act out.”) One day, Pat’s daughter was angry that Pat would not let her go to a party and called Child Protective Services in retaliation. 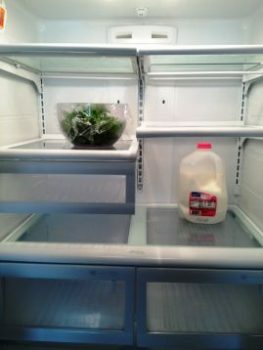 This eventually resulted in Pat’s daughter being removed from her house as CPS deemed there was indeed not enough food. In short, the state sanctioned Pat for having the “right” human ethics –wanting to be with her mother when she was dying and for drawing a necessary boundary with her teenager. Why Are People Punished for Being Poor? I am well aware how non-poor people in the United States are generally socialized to view this scenario. It is difficult for people who have not had to deal with the state’s punitive measures, food scarcity, and poverty to understand that this is not an out-of-the-norm practice. Also, mainstream folks often are socialized to blame the individual in poverty. However, looking for loopholes to justify the state’s actions is unacceptable. We must ask ourselves why situations like this continue. In case anyone was wondering, there were no good paying jobs in the area where Pat lived. She had no chance of moving out of the area. Plus, the slow and steady chains of class and race and gender oppression had already squelched her soul. To me, this was and is unacceptable. Bill Clinton’s “Personal Responsibility Act,” touted as teaching poor moms on welfare the “right” work ethic, harmed many poor women and children. It is an example, in my opinion, of economic human rights violations in the United States. What kind of country punishes poor women and children for being poor by taking away their access to food and then breaking up families? Since 1996, life for impoverished women is much harder – while corporations are much richer. Individuals and families across the country are even more likely to have their basic needs unmet, including the need for food. Many studies show that across the United States one in eight people, many of whom are children, lacks access to food at some point in time. Yet, there is an embarrassing amount to eat if you sit in a privileged position in the class structure. In fact, a lot of this food goes to waste. I have had many of my students attempt to address food scarcity by asking restaurants to donate food – only to find out that there are laws in place which prevent restaurants from donating nourishing, safe food. There are even cases of folks getting arrested for giving food to people who are homeless and on the street. This is America 2018. Given that a lack of access to food causes other health, social and academic problems, it is hard to understand why this is even an issue. But it is. Clinton’s “reforms” did nothing but escalate the problems of food scarcity and hunger. No one should have to go through what Pat and her children went through, but so many do. Food should not be withheld from human beings as punishment for not complying with unjust mandates – or for any reason. Since the state caused the issue, it should find a way to rectify the situation by making sure everyone has access to safe and healthy food. Don’t you agree? * Name changed for the purpose of anonymity. Nicole Braun has been teaching sociology for over two decades as an exploited adjunct. She raised her son by herself as a struggling single mom so she has had quite a lot of experience with classism. She cares deeply about social justice and looks forward to a day when there is true justice. I now live in SE Missouri, the county I live in has a poverty rate of 32.2% and I’ve been working in Social Services for the past two years, not my chosen field but finding a decent paying job down here is not easy. And I have empathy, and I do what I can. I’m shocked at the poverty here, I lived on the west coast for years and was considered Middle Class, I now am considered Working Poor Class. I work two part time jobs, one with Habitat for Humanity at $10 an hour and the other with DAEOC/DeltaCorps until September at $7.89 an hour. No benefits for either job, I have no insurance because I cannot afford it. I have an old house that needs work but of course I have no money to hire someone to fix things. I took several years working low paying jobs to be more able to help care for my aging mother which caused me to go through my savings. So, here I sit in a very depressed area, I’m almost 62 and I think I’m going to have to take my social security early just to be able to survive. And I will still have to work. I’m tired and when people ask when I will retire I say the day before my funeral. I’ve watched what is going on down here, there are no decent paying jobs, there is a woman with a high school degree working as an Executive Director of the Food Bank who gives herself $25,000 bonuses and makes $130,000. She is stealing from a non profit agency! An agency that gives food to the poor, she has nothing good to say about these people. Its disgusting! I think if you ask one of these poor people down here if they would rather work and support themselves, they would tell you that they would love to! There are no jobs here! The education her is sub par in a lot of places because the teachers are paid a pittance. The farmers here who have the money don’t shop here, they go to the larger cities like Memphis and St Louis! How can these people ever get out of poverty? And now the so called “government of the united states” wants to take away their food stamps and send them a box of food, I get a CSFP box of food and I have to say, most of it is crap! I am so angry with what I see down here and I just don’t know how to help. We need decent education for our young and we need decent paying jobs here as well. How do we get those basic needs? There is no American Dream here! The food insecurity, the low wages, the lack of any kind of ability to relocate, move/time spent caring for a loved one/aging parent, the lack of healthcare, a house that is falling apart, all of these are happening and are social problems. How brave of you to articulate it. The box of food seems like one of the last straws, to me, I wonder how much more people can take? In many places across the US, the American Dream is dead, or the American Dream never was to begin with. When you think about what you can do given where you are “planted” now, what ideas do you come up with or consider? I also wonder if it is possible to be happy in this space/place? I wonder, too, how to reach people who feel like they are living some form of the American Dream, and thus do not agree that this is a problem? Also, it sounds like you really enjoyed living on the west coast; it is impossible to live there unless one has class privilege, at least that is the way I see it. Thank you again for sharing. Please keep in touch! Thank you again.